As Fermanagh, Ireland, prepares to host officials from the wealthy G8 nations, run-down and abandoned stores have been painted over with images of "free-market" prosperity. 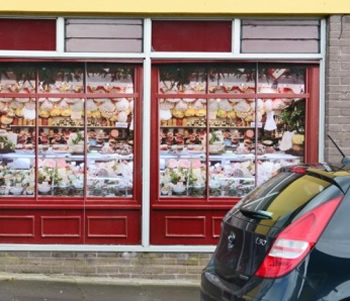 The happy, thriving butcher's shop pictured here consists of stickers plastered to windows. It wouldn't do for the architects of austerity to see its actual effects. PERI: Does High Public Debt Stifle Economic Growth? The United States is rolling in wealth, but the wealth is piled up in the hands of a tiny oligarchy. That is the real project of austerity. Public funds are flowing like water, but they're flowing into the Pentagon and prisons and tax breaks for the wealthy, while we cut education, environmental protection, and infrastructure. Let your public officials know right now that you don't want more of the same to come out of the G8 summit in Ireland.